Barcelona, alongside many other European cities, is fighting for greener last-mile delivery solutions. The Barcelona City Council no longer wants conventional motor vehicles. Its Urban Mobility Plan is demonstrative of this, giving enthusiastic preference to bicycles and pedestrian transport. According to Olivier Vander Elst, electric bike expert from GreenAer, E-cargo bikes are the disruptive solution that will transform cities, particularly cities like Barcelona where cycling infrastructure is already in place. 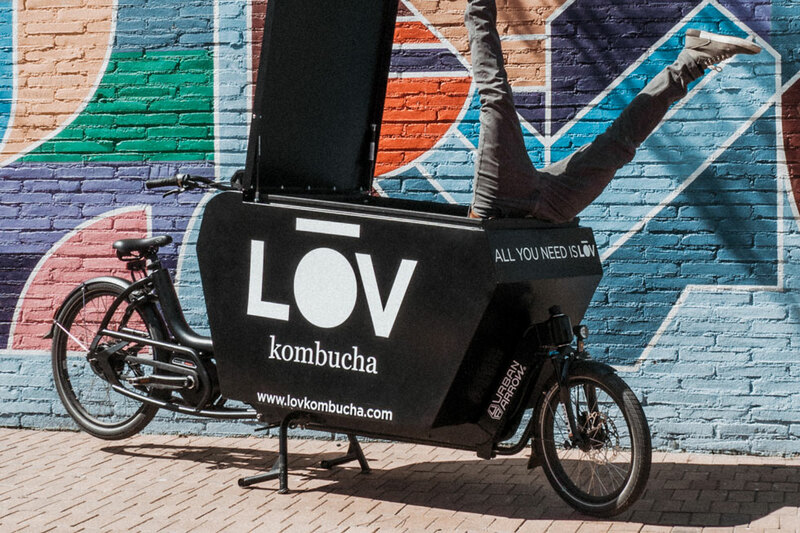 Some of Barcelona’s more conscious companies, like kombucha producer LOV Kombucha, are looking to be a part of the city’s green revolution. It’s only logical, of course. In an average day in Barcelona, there are over 500,000 vehicles en route. Not only is motor transport expensive, but it is the root of poor air quality, congestion, CO2 emissions, road danger and noise. On top of that, in Barcelona there are 3,500 cases of premature death, 31,000 cases of child bronchitis, and 54,000 asthma attacks. Barcelona has the highest density of cars of all the cities in Europe, and its citizens have had enough. Take Eixample, a Barcelona neighborhood sandwiched between Gracia and the Old Town. Every weekday, half-empty delivery trucks throng its corners corners only to deliver a couple of boxes or small packages. This is neither safe nor necessarily legal. Most of the time the trucks take far more space than they need for the size of what they’re delivering. And it’s not only air pollution. Olivier explains that even one moped crossing the city could wake up a hundred thousand people. Noise pollution is a real issue. When trucks moving mostly air are causing traffic, pollution and disease, we know things need to change. One might think that switching to electric vehicles is a good enough solution. Well, surprise, surprise – it’s not. Large vehicles still take up too much space in the urban landscape. There are trikes with 1,500 – 2,000 L capacities, but these are cumbersome in the bicycle lanes, make it harder for other cyclists to navigate, and eventually lead to many of the same problems as trucks and vans. Ultimately, these mid-size cargo vehicles are no better than an electric car. How Can Businesses Make A Difference? It’s not only up to the government to make changes. Businesses in Barcelona are taking on responsibility as well. Last mile is the “most costly and highest polluting segments of the supply chain”. Business leaders looking to make a positive impact on the local community have chosen a solution so simple it seems obvious: e-cargo bikes. Not only is it making a minimal impact, but it’s cheaper than motor alternatives. Plus, bikes are the fastest form of city transport and the riders tend to enjoy the exercise of riding the e-bike during their deliveries. Companies like Som Energia and HolaLuz offer electricity from strictly renewable resources at competitive prices. In fact, a European study showed that switching to e-cargo bikes in urban areas implies massive cost and CO2 savings. That’s why conscious business leaders are transforming last-mile logistics by using electric bikes for distribution and delivery services in urban areas. LOV Kombucha is a new face in Barcelona’s beverage landscape. Though a drinks producer, the company’s main goal is to transform and improve the community. Since day one they have used electric bicycles for their e-bike deliveries and are advocating for business solutions that are greener and have higher social impact. Nicolas Lavalliere, owner of LOV Kombucha, is directing his business to be a horizontally organized, green and positive impact in the city. E-cargo bikes along with other progressive solutions are the Catalan capital’s new business trend. Barcelona is ahead of the game. Vans and motorized vehicles are being increasingly banned access to the routes at certain times of the day. And Barcelona wants to see the city alive, well and riding. In urban areas, there is a shorter distance between stops: standard vans and cars have no speed advantage. E-cargo bikes save space because they’re small, they’re faster because they can take bike lanes and get through traffic easier, and they’re more efficient because they have zero emissions. E-cargo bikes will be the face of Europe’s green revolution. Soon, citizens will live in cities free of air and noise pollution, and businesses will thrive even more.